says Cindy Evans, an Earth scientist and long-time trainer and ground-based guide to astronauts. The summer of 2011 has been a time of nostalgia and blessings-counting for much of the NASA family. The final flight of the Space Shuttle program has us remembering many triumphs, fallen heroes, and signature moments. It also has us thinking about the next giant leaps for humanity and for Earth science. In the meantime, there is an actual mission going on, which you can follow here. In this astronaut photograph, the Space Shuttle Atlantis approaches the International Space Station for docking for the last time on July 10, 2011. Part of a Russian Progress spacecraft, also docked to the station, pokes into the upper foreground. Beneath them all lie the teal-colored shallows around the Bahamas. captured these images on April 16, 2010. The sequence begins as the Shuttle emerges from darkness over the Canadian Rockies, traversing the United States southeast towards Florida. 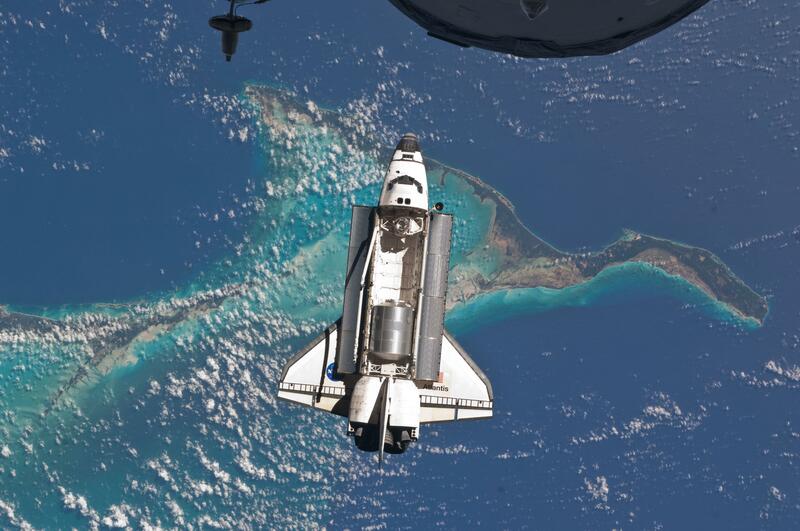 The Bahamas and Hispaniola are seen as the Shuttle continues over Venezuela, Brazil and finally the southern Atlantic ocean before returning to darkness. 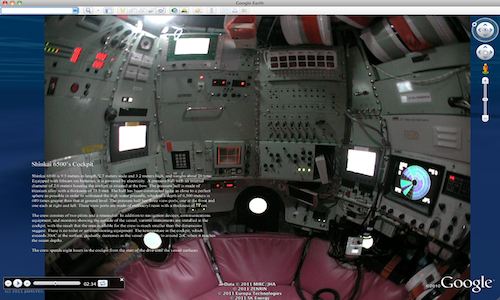 Learn more about life at the bottom of the sea as the Shinkai 6500 explores the Google Earth ocean. The ocean covers approximately 70 percent of the Earth’s surface and yet remains one of the most mysterious places on the planet. In Japan, bodies of water with depths over 200m (656 feet) are referred to as shinkai, or deep sea. These dark regions of the ocean do not receive light and water pressure is up to 100x higher than at the surface, making the shinkai inaccessible to most exploration. In honor of Marine Day in Japan, we collaborated with JAMSTEC (Japan Agency for Marine-Earth Science and Technology) and the manned Shinkai 6500 submarine to share this hidden world through Google Earth. Dive beneath the surface to explore the shinkai, as well as shipwrecks, research discoveries, surf spots and more. The Shinkai 6500 is able to dive to depths of 6,500m (21,325 feet), a feat few other vessels can match. It is equipped with a variety of research devices such as search lights, cameras and robotic arms. A cockpit enables three pilots to withstand the extreme conditions and even includes a spyglass for visual exploration of the deepest parts of the ocean. Shinkai 6500’s mission is to bring the secrets of the deep sea to the surface for marine enthusiasts. It studies movement of the Earth’s interior, living organisms equipped to survive the most extreme conditions and the impact of hydrothermal activity on the environment. In order to bring this research to life, we worked with JAMSTEC to create a Google Earth tour showcasing past Shinkai 6500 endeavors to the ocean floor. 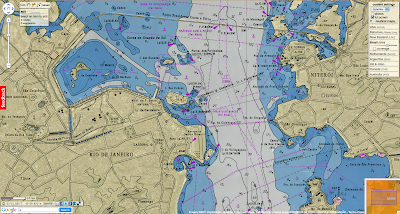 Join the crew by downloading the KML file (in English or Japanese) and opening in Google Earth. 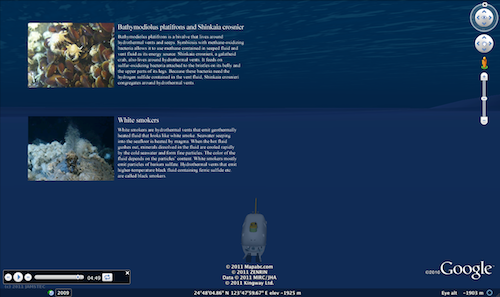 The Shinkai 6500 tour highlights previous deep sea missions and marine life. As the submarine descends, you will learn more about the vessel and the creatures it finds in the deepest parts of the ocean, including historical imagery from past ventures. Discover unique deep sea features and lifeforms - from rare translucent fish such as the Liparis to hydrothermal vents known as white smokers. 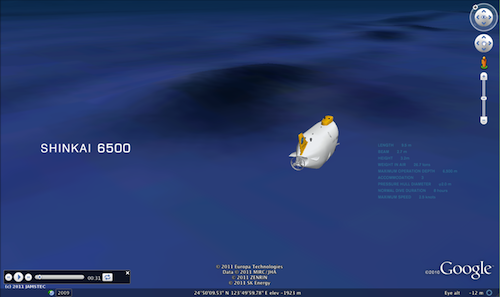 We hope the Shinkai 6500 inspires you to continue to explore the deep sea and its hidden treasures. 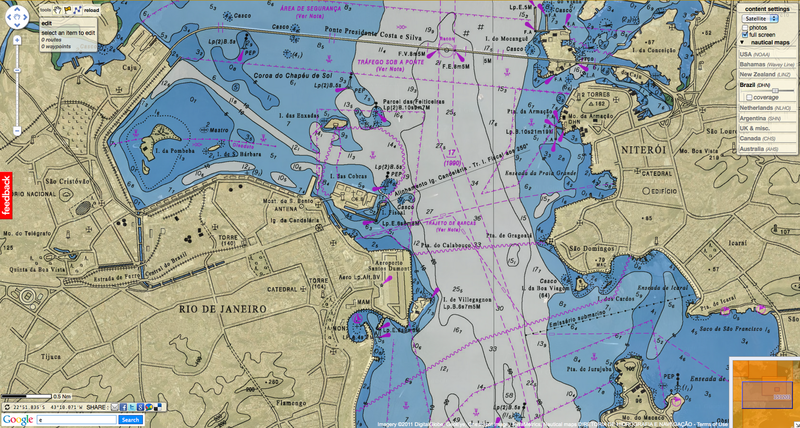 We recommend starting with the ocean seafloor tour or deep sea vents ridge 2000. 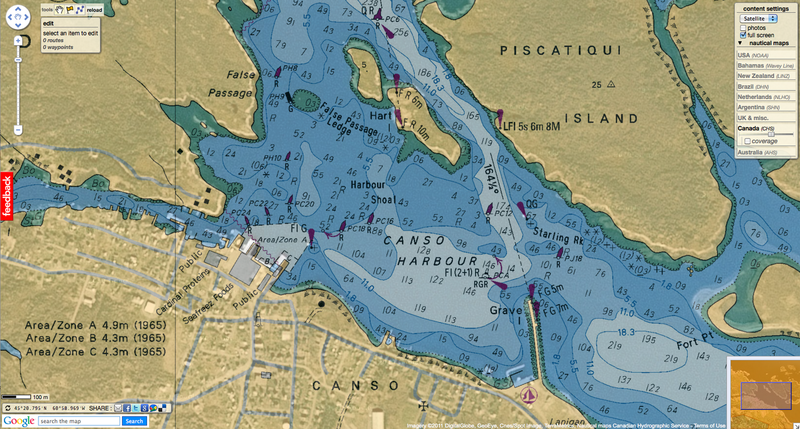 You can find even more ocean tours in the Ocean Showcase on the Google Earth website. The largest canyon in the ocean is Zhemchug Canyon, a giant underwater canyon located in the middle of the Bering Sea. The canyon has a vertical relief of 2600 meters dropping from the shallow shelf the Bering Sea to the depths of the Aleutian Basin. Zhemchug Canyon is deeper than the Grand Canyon in the United States. Seven hundred feet below the water, deep in the submarine canyon off Monterey Bay, there is complete darkness. Creatures almost entirely beyond our comprehension have evolved here, and this week they were joined by Richard Hammond. Hammond was presenting his Journey to the Bottom of the Ocean (BBC Two), but even set against some jaw-dropping imagery of underwater volcanoes and a giant virtual Earth, to these eyes he is a distraction. His route from Top Gear’s Norman Wisdom to the godhead of prime-time science is as mystifying as the provenance of neon squids deep in the abyss. The fact that the full title of this programme was Richard Hammond’s Journey to the Bottom of the Ocean tells you that BBC executives believe that he has reached a level where it’s “The Hamster”, as much as the wonders of our planet, that gets the bums on seats. Which means that what was otherwise an impressive science documentary was continually forced to accommodate its star man. Nods to his Top Gear persona meant he had to keep doing things such as going for dives, or descending in submersibles, to no discernible end. Every machine was a “serious bit of kit” to get boyishly overexcited about. And every excursion was served up with just a splash of potential peril, because Hammond is the TV guy who does daring things in serious bits of kit. Perhaps if he came with a dab more authority – he is not, and has never claimed to be, any kind of scientist – his presence would feel less intrusive. But when one of the most astonishing natural marvels on display is a small man’s haircut, then you know that the presenter needs to step out of the picture. The size of the Aral Sea has long hinged on the Amu Darya, which flows from the high Pamir Mountains in central Asia, across the desert, and into the southern sea. While two rivers empty into the lake—the Amu Darya and the Syr Darya—the Amu Darya is the largest and most fickle source of water. At times in ancient history, the river has bent its course to empty into the Caspian Sea, and the abandoned Aral Sea shrank. The Aral Sea has been at its largest when the Amu Darya feeds it. Modern trends are no exception: when water began to be diverted from the Amu Darya for vast agricultural projects starting in 1960, the Aral Sea began to shrink. This image, taken on August 26, 2010, by the Moderate Resolution Imaging Spectroradiometer (MODIS) on NASA’s Terra satellite, demonstrates the close connection between the Aral Sea and the Amu Darya River. It is the most recent image in a ten-year sequence published on the Earth Observatory’s World of Change: Shrinking Aral Sea. Between 2000 and 2009, the Aral Sea steadily shrank. In 2006, severe drought settled in over Amu Darya Basin. Very little water reached the Aral Sea in 2007, and nothing flowed from the Amu Darya to the Aral Sea in 2008 and 2009, says Philip Micklin, a geographer from Western Michigan University who has been monitoring the Aral Sea for many years. 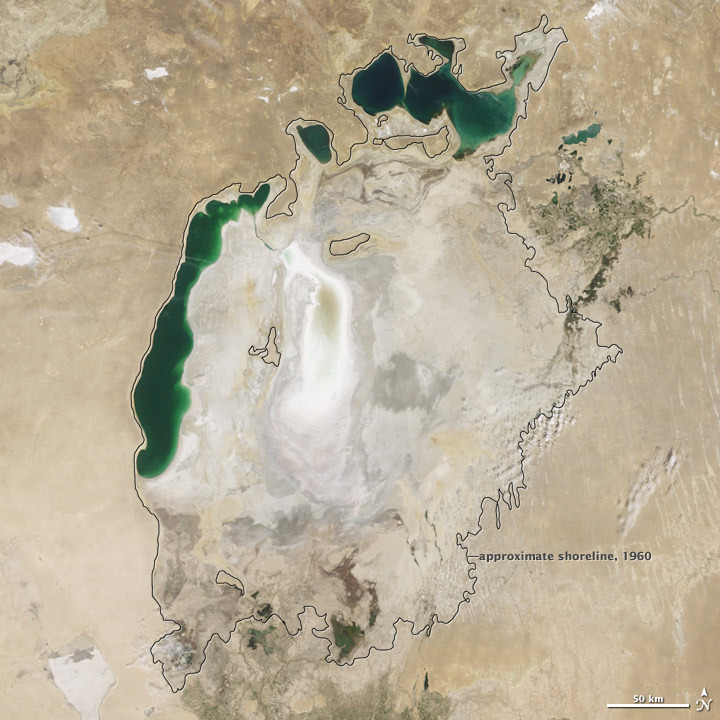 Without water from the Amu Darya, the southern Aral Sea rapidly dwindled, the eastern lobe all but disappearing in 2009. In 2010, however, the drought broke. Snow in the Pamir Mountains was normal, and enough water flowed into the Amu Darya that the river reached the Aral Sea. The muddy pulse of water settled in a shallow layer over the bed of the eastern lobe of the South Aral Sea, making it look much larger than it had in 2009. Before 1960, the Aral Sea was the fourth largest lake in the world. However, much of the Amu Darya and Syr Darya have been diverted for agriculture, limiting the flow of water into the sea. Since 1960, the Aral Sea has lost 88 percent of its surface area and 92 percent of its water volume, says Micklin. The dolphins of Australia’s Shark Bay, famed as Earth’s first marine tool users, likely turned to gadgetry because echolocation couldn’t find the best fish, especially for hurried moms without time to hunt. It was in 1984 that researchers first observed the dolphins fitting basket sponges over their beaks, then scraping through seafloor mud to disturb hidden fish. Research subsequently showed this behavior to be full-blown tool use, taught by mothers to their daughters and representing a profound difference in lifestyle between them and Shark Bay’s other bottlenoses. A basic question remained unanswered, however: Though sponges clearly protected sensitive dolphin snouts from jagged pieces of rock and coral, why scrape seafloor at all? Why not rely on echolocation to pinpoint target prey? (D) hiding prey, barred sandperch (Parapercis nebulosa). All photographs taken by Eric M. Patterson. Most fish scared from the muck were bottom-dwellers lacking swim bladders, the air-filled organs that help fish control their buoyancy. Compared to fish flesh, which interferes with acoustic signals just slightly more than water, air bladders stand out on sonar. Without them, bottom-dwelling fish are nearly invisible to echolocation. Hence the value of scraping through seafloors manually, and thus the need for a device that protects dolphin noses from scraping. Hunting with sponges has allowed Shark Bay’s bottlenoses to fill an empty ecological niche, eating fish that other dolphins ignore, wrote Patterson and Mann. The findings also suggest why sponge foraging likely arose among Shark Bay’s females and has remained their province, taught by dolphin mothers to daughters rather than sons. Whereas dolphin fathers are mostly absent, free to roam and chase prey in the open ocean, dolphin moms spend years with their calves. They need to put food on the figurative table but have little time to do it. Sponge-fishing is convenient and nutritious, a family recipe for quick-but-delicious dinners passed on to daughters who will someday need it. July 15, 2010 was a day of relief for many - even for folks up here in West Virginia - after 2-1/2 months watching helplessly as oil and gas billowed relentlessly into the Gulf of Mexico from BP's runaway Macondo well. On that day one year ago, the final valve was carefully closed on an improvised "capping stack" that did the job after a string of heartbreaking failures. By that time an estimated 172 million gallons of oil had spewed directly into the Gulf, vastly exceeding the Exxon Valdez tanker spill of 1989 -- making it the nation's worst oil spill, and the world's worst accidental spill. After cumulatively covering an area the size of Oklahoma, the massive oil slicks on the Gulf's surface began to dissipate almost immediately under the steady assault of evaporation, wind and wave action, biodegradation, photolysis, and cleanup efforts. We last observed significant oil slicks on satellite images taken July 28. 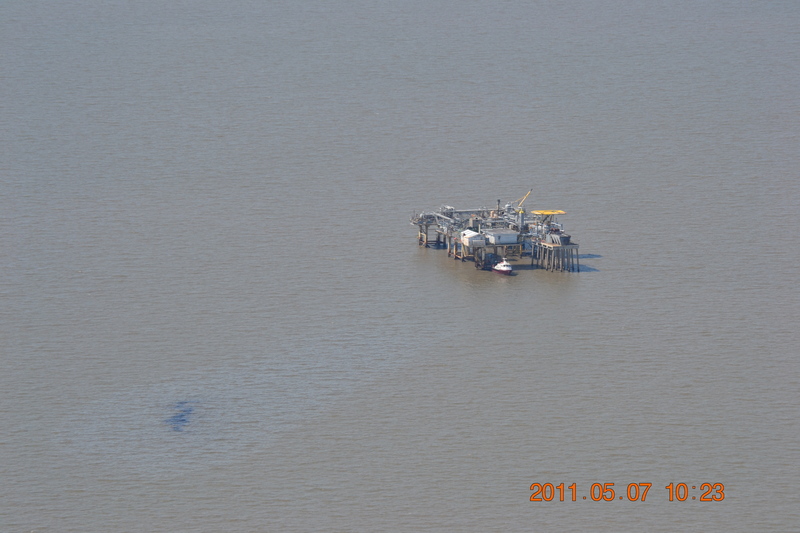 Aerial photograph taken May 7, 2011 showing apparent oil leak originating from an oil and gas production platform in state waters 1.1 miles off the Louisiana coast, 37 miles east of Grand Chenier. Unknown if this was a one-time release or a chronic leak. Photograph by Jamie Ward, courtesy of SouthWings and pilot Dan Luke. But unknown amounts of oil and chemical dispersant lingered beneath the ocean's surface, out of sight, with an uncertain fate and as-yet untallied environmental consequences. What is clear is that this spill caused significant economic damage to the Gulf seafood and tourism industries, upsetting the lives and livelihoods of people as far away as Virginia. And oil from the spill continues to wash ashore along the Gulf coast. Meanwhile, Congress has yet to pass any new laws governing offshore drilling safety. In fact, they are going backwards by reducing funding for government inspections and oversight -- despite the fact that the oil industry itself requested more funding for BOEMRE, the agency that manages offshore drilling. the lack of consistent fines for polluters, a moral hazard that encourages sloppy operations and risk taking, all but ensuring another major disaster. Oh yeah, and the 5,100 new oil and other hazardous materials spills in the Gulf region reported to the National Response Center since July 15, 2010. "I've always been intrigued by what happens below the surface, like what's happening where we can't see." While watching the slide-show on Mark's laptop I'm amazed at the detail of this 'other world' that's portrayed with his selection. As an accomplished documentary photographer, in the past Mark has used the ocean as an escape for some solace away from his projects. Lately, while between projects he's been "hanging out" below the surface trying to capture what happens while swimming on a slow summer's day. "Coming from a surfing background I used to wonder what happens when we're duck-diving, like, what it looks like from a different angle than what we can see. Kinda hard to explain but it has always been on my mind. I used to surf with a small video camera and housing attached to my helmet, (pauses) it worked surprisingly well but my neck couldn't take the impact and stress while trying to duck-dive and capture the right angle. Even tried to turn it back on myself to see what happens clearer but that, uh, sucked (laughs). I looked for a new approach to capture what I was seeking, which basically meant getting off the surfboard."